Prosecutors say video shows Kenneth Lilly pulling out his 9 millimeter semiautomatic pistol from its holster, walking back to the front of the bus and firing five shots at the bus windshield. MINNEAPOLIS — A St. Paul man is charged with attempted murder in the highway shooting of a school bus driver following a minor traffic accident Tuesday afternoon. Hennepin County prosecutors say 31-year-old Kenneth Lilly will make his first court appearance Friday on charges of second degree attempted murder and second degree assault. A criminal complaint says the shooting happened after the bus driver tried to merge onto I-35W near Chicago Avenue and the I-94 split. Witnesses say the bus apparently scraped Lilly's sedan. The bus driver later told authorities he didn't know he hit the vehicle, but black paint was found on the school bus. Traffic cameras recorded the defendant getting out of his vehicle and approaching the bus, but the driver wouldn't let him on as there was a student aboard. Video shows Lilly walking toward the front driver’s side corner as the bus appeared to slowly pull into traffic. Lilly then walked to the driver’s side of the bus where he pulled out his 9 millimeter semiautomatic pistol from its holster. He then walked back to the front of the bus and fired five shots at the bus windshield, the complaint states. 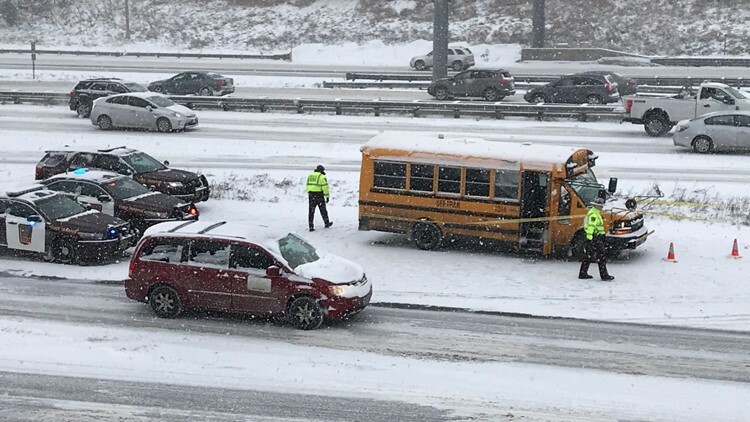 A Minneapolis Public Schools bus driver was shot and injured on Interstate 94 eastbound Tuesday afternoon. After the shooting Lilly called 911, telling dispatchers he fired because he feared for his safety. Prosecutors say video footage refutes that claim, however, as Lilly retreated to a safe spot before walking in front of the bus and opening fire. Officers reached the scene and arrested the defendant, who was dressed in his security guard uniform. The bus driver was taken to the hospital to be treated for a wound to his arm and a cut where a bullet grazed his head. The eight-year-old child on the bus stayed with officers on the scene until another bus arrived to take her home.